An artists impression of the Mars Global Surveyor in orbit above Mars. NASA's Mars Global Surveyor was launched on November 7, 1996 from Cape Canaveral Air Force Station (Florida) on a McDonnell Douglas-built Delta II-7925 rocket. 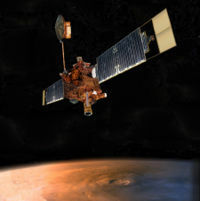 Mars Global Surveyor was the first successful US mission launched to Mars in 20 years since the Viking mission in 1976. On November 2, 2006 it was lost due to loss of power (through incorrect alignment of the solar panels). On arriving into Mars orbit, the Mars Reconnaissance Orbiter made attempts to image the lost Mars Global Surveyor so mission control could diagnose the problem, but the spacecraft could not be found. Observations from the Mars Global Surveyor orbiter are used on the interactive Google Mars website. In its highly successful decade of operations, the Mars Global Surveyor orbiter became the longest-lasting Mars mission collecting a massive quantity of data about the Martian environment. The Mars Orbiter Camera (MOC) onboard the Mars Global Surveyor: Global views of Mars in the late northern summer (2002). Topographic map produced with data from a laser altitmeter onboard the Mars Global Surveyor Colors show relative elevations. 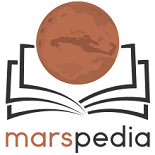 Characterize the surface features and geological processes on Mars. Determine the composition, distribution and physical properties of surface minerals, rocks and ice. Determine the global topography, planet shape, and gravitational field. Establish the nature of the magnetic field and map the crustal remnant field (a crustal remnant field is evidence of magnetism within the planet's crust or rocks, produced by the planet's own magnetic field at the time of formation). Monitor global weather and the thermal structure of the atmosphere. Study interactions between Mars' surface and the atmosphere by monitoring surface features, polar caps that expand and recede, the polar energy balance, and dust and clouds as they migrate over a seasonal cycle. Magnetometer data from the Electron Reflectometer onboard the Mars Global Surveyor. Mars Orbiter Camera (MOC) - to produce daily wide-angle and narrow-angle images of Mars. Mars Orbiter Laser Altimeter (MOLA) - to measure the height of Martian surface features such as mountains and depth of valleys. Thermal Emission Spectrometer (TES) - analysis of infrared radiation by scanning the heat emitted from the surface of Mars to gain insight into the mineral composition of the surface. Electron Reflectometer (magnetometer) - to understand the magnetic properties of Mars to probe the interior of the planet. Gravity Field Experiment (Radio Science) - mapping the gravity variations in Mars' gravitation. Pattern of large and small tracks made by giant dust devils as seen under the MOC Public Targeting Program. Image is located in Eridania quadrangle. Latitude dependent mantle on a cliff face. The circled part shows the edge of the mantle. Mantle falls from the sky and is ice-rich. This page was last edited on 17 December 2018, at 17:21.